Roda Beach Resort is a stunning beach-front hotel situated in Dubai, United Arab Emirates. It is just a few steps away from the lively city life that include shops, cafes and restaurants. There is a wealth of swimming options for the guests, as the hotel comprises two outdoor swimming pools. The hotel also facilitates the guests with sun beds by the pool. The rooms are very airy and bright giving guests a home-away-from-home feeling. Other than this there is a fully-equipped fitness centre, which will help the guests to stay fit. There are plenty of attractions near the hotel that include Sunset Mall, Dubai Mall – the world’s largest shopping centre with the Dubai Aquarium, Underwater Zoo, an ice rink, cinema and entertainment complex as well as 200 food and beverage outlets, Aquaventure Waterpark, Burj Khalifa - The world’s tallest building, Dubai Offshore Sailing Club, Miraj Islamic Art Centre and Dubai World Trade Centre. The Roda Beach Resort is ideally situated in the heart of the city. 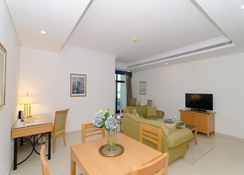 It is set in the most privileged areas in Dubai offering the guests the best of the best. The Dubai International Airport is about 20km from the hotel, while on the other hand the Jumeirah Beach is a mere 2.4km. Charming, magnificent and bright are some of the words that describe the rooms and villas in the Roda Beach Resort. 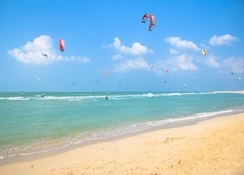 At Roda Beach Resort, there are four different accommodations to choose from, including deluxe five bed villa, superior city chalet, one bed city chalet and one bed beach chalet. all the rooms and villas are fully equipped with fully fitted kitchen, bedroom with king size bed, en-suite bathrooms with shower and bath, large balcony with sea views, complimentary Wi-Fi throughout, satellite television, laundry services, valet services, housekeeping services, air conditioning, private parking, 24-hour security and maintenance. Situated in the lobby of the beach resort, the café at the pool side serves lip smacking breakfast and a wide selection of delicacies that include fresh smoothies, light snacks and ice cream. Both indoor and outdoor seating facility is available at the café and complementary Wi-Fi is also provided. Or order food and drink from the comfort of your room by leveraging the in-room food and beverage service. There are ample sports and leisure facilities in and around the hotel to keep the guests engaged throughout the day. 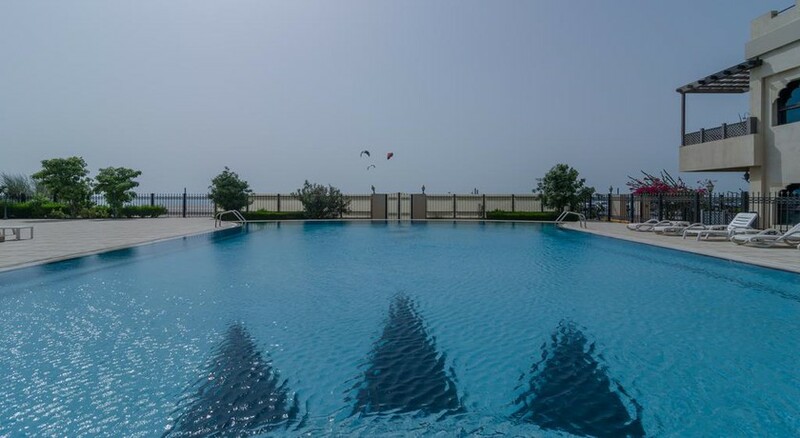 Dive into the large outdoor swimming pool and relax on the un loungers spread around it. The pool is open from morning to night leaving you lots of time for fun. It is a great place to stay if you are fitness conscious, as there is a well-equipped gym that includes free weights, private locker rooms and stretching area. Other than this, there is a steam room and sauna for sweating out.